Arrival in Fez, We will pick you up from your hotel or Riad then drive south to Azrou via Ifrane (switzerland of morocco) and then to the Middle Atlas mountains stopping by cedar forest You will be able to take some fascinating photos with the Barbarian Apes we will continue the way through the Atlas Mountains enjoying the landscapes of Midelt, After lunch we’ll continue our journey through the Ziz Valley to Erfoud, Rissani and Merzouga.on our arrival there will be welcomed by a cup of tea .over night at the Hotel/Riad. After breakfast we’ll start exploring the area, we will begin by visiting the village of black people originaly from Mali to enjoy their music and the way they live.after that we will drive to Miffis Mines to explore how they work over there before getting behind the Dunes in a full desert with charming views where we will sit for a cup of tea with the berber Bedouins who are living under tents and who takes care of herd of cattle,goats and camels ,Before returning back to the hotel,after a cup of tea your local guides will teach you how to mount and dismount and other handy camel-related safety tips then you begin exploring the mysterious sand-sea of the Erg-Chebbi.over night in a berber tent. 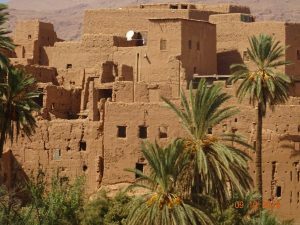 After breakfast in the hotel we’ll drive through the Dades Valley towards Kalaa M’gouna and The route of thousand kasbahs providing numerous and charming views. 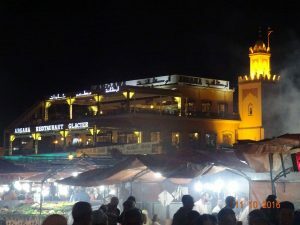 then We’ll drive through “the city of roses”,which is known for the production of the rose water Continuing into Skoura and and its palm groves before getting to Ouarzazate “the Hollywood of Africa” attracted many world class movies producers.we will visit Atlas Film corporation studios before reaching our hotel.overnight at Hote/riad. 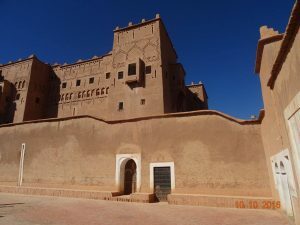 After breakfast in your hotel, we drive to Marrakech, our journey will includes the visite of Ait Ben Haddou Kasbah. The largest one in Morocco and( UNESCO World Heritage Sites since 1987) before driving through the majestic Tizi n’tichka Pass (2260m) over the High Atlas Mountains to Marrakech. 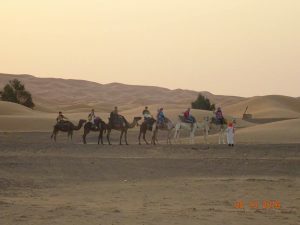 Overnight at hotel /riad.